So, grilling is an all year 'round affair in our house. I've grilled pizzas during snow storms. I've fought rain to cook chicken in the spring. But we all can agree: summer is truly the season for grilling. That being said, I went into this summer somewhat ill-prepared for our grilling adventures. We stocked up on a solid grill brush, and we cleaned up our grilling utensils so they were ready to go. But one thing we did not have on hand was a quality grilling thermometer. And that's a no-no in my book. Ever since I did a small campaign with the USDA on food safety, I've been somewhat spooked about cooking meat. In a very good way, I'm so much more aware of the importance of cooking meat properly, and making sure the internal temperature reaches the appropriate degree. No one wants to get sick after an awesome summer cookout! Until recently, we had a very rudimentary cooking thermometer. It was cheap, and we thought it would do the trick. The thermometer couldn't handle the fluctuations and intensity that comes with grilling, and I found that back-to-back readings (which are important when grilling) were inaccurate. I still made sure to cook the meat long enough to safely serve, but I always feel better when I can see the internal temperate before pulling anything off the grill. 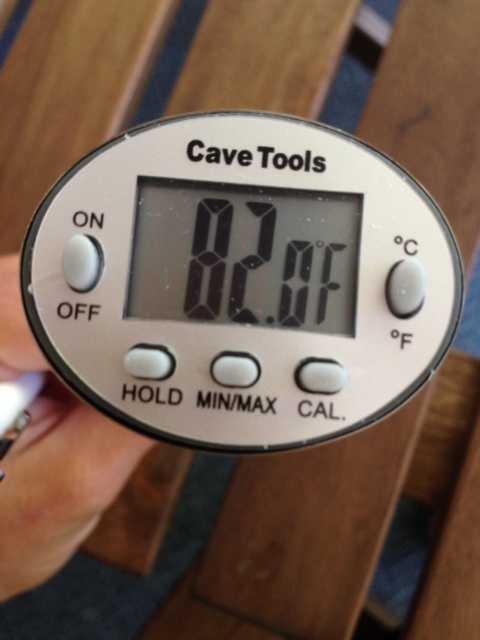 I had a chance to try out the Cave Tools Digital Read Thermometer this summer, and it has been a LIFESAVER. First, you get an instant read on the temperature within SECONDS. No agonizing over waiting for the little analog hand to tick up or down. Cave Tools Digital Cooking Thermometer is not only waterproof and shatterproof (important when you have kids! ), but it's also calibrated with a special feature which allows it to always be accurate. This thing is my grilling lifeline, and it's practically indestructable. Cave Tools Digital Cooking Thermometer to your grilling accessories! To order online: click here .